It's soooo big, it takes a moving van to bring it home. My mind probably isn't going where Jenn intended, but why should this week be different than any other? I just got back from Costco's where I was supposed to do two things: (1) Take back the pants in the backseat of my car that are too big and (2) Buy candy for my class. Of course I did neither. I remembered the pants while strolling out the door, but with Memphis' 91* weather, I decided my fudge bars wouldn't appreciate alone time in the trunk. The infamous "they" say to never shop when hungry, and Mr. They is right! I bought strawberries, blueberries, a massive package of pizza rolls all because I was hungry and it looked good . . . even though these things go "beyond the limits" of what my fridge holds. To make room, I could throw out the moldy something in the back, a jar of pickle relish (everyone here hates sweet pickles), or the half-eaten yogurt that's probably reproduced since it contains "Live Cultures." What does live cultures mean anyway? The item that really goes beyond our limits is the big a$$ pizza I bought--pesto, tomatoes, chunks of whitish-yellow cheese, and green leafy things. Yum! Never mind the fact that our household is down to two. It looked good, and repeat after me: I was hungry. This Costco pizza is sooooo huge, it goes beyond the limits of my fridge and must move directly from car to oven; but, Houston we have a problem. When I tried to lift it into the oven, it cracked on the side and rained chunks of cheese, tomatoes, and those leafy green things onto the rack and beyond. So here I was, scooping up sizzling ingredients off the bottom of the oven. No doubt, it will stick, burn, and make a horrid mess. Will I buy it again? Probably. Why? Because One day I'll be hungry! Thanks for stopping by. Please leave a comment, (((hugs))), and a click on the picket fence. And if you're in town, stop by for some pizza . . . unless, burp! Maybe I should keep the pants that are too big. I never to shopping when I'm hungry because I do just this. I want anything that looks yummy and int he basket it goes. As for the pants? You might want to hang onto them. Bwahahahahahaha. TOO funny! When the kids lived at home, my hubby used to drag one of them to Sam's every week and I always gave him a hard time about how much stuff he bought. Then one day, I went there. Holy crapanoly. You don't have to worry about extra pizza if I'm around. Guaranteed! And who's that handsome fellow on the left up there? Thanks for the plug, Joyce! Thanks for the visits and comments. I think I'll go stick my finger down my throat now . . . I'M KIDDING! If anyone has an answer for the live culture thing I'm curious, because does it really matter that much? 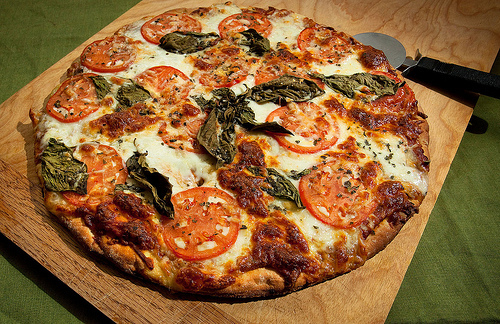 Anyway, that pizza looks stupendous and I'm going to Costco tomorrow so I may be in trouble. The pizza looks good but what looks and sounds even better is your lovely sense of humor, and the enchanting manner of your story-telling. Allow me to hug you and kiss you, muah :). Hahahahahaha! Pants, hunger and a Costco run all in one trip! I could never have completed the task. Instead of pizza, I would've walked out with a new television, a couch and a bunch of New York Times' bestsellers. Lucky for me, I have boxes to put them in. Good to catch up with you Joyce. You are witty and joyful. yup, dont shop when you're hungry! i usually buy too much too, need a fridge like on phineas & ferb when they painted the desert! Thank you for linking up on the w/w hop! I have another hop going on today (Fridays) called “Flash-back-Friday.” Link up an old post for a flash form the past! It’s like looking in an old scrapbook. Feel free to link up! I’ll choose a random blog to feature each week. See you soon! Awe man! You just made me want some Pizza rolls. Rhis is a funny post. I do the same thing when I go to those big discount stores. Everything is so big that I never have space for it. I can never say no to Pizza and that one looks delish, I think I will go out and get myself some. Hi Joyce. When we shop at Costco (in the UK) everything seems to be huge! If we get a portion of Pizza in their cafe one piece fills me. The packs and size of everything is larger than in regular stores. Is it the same over there? Thanks for all the comments. Everything is huge at our Costco's here too. That's why it's so silly to buy that monster pizza when it's just my husband and me. LOL Joyce, but good news, eat the entire giant pizza and the pants wont be too big anymore. Just kidding :) If you ever make it here, you will see that everything is beyond the limits of the fridge, as the fridge is tiny.